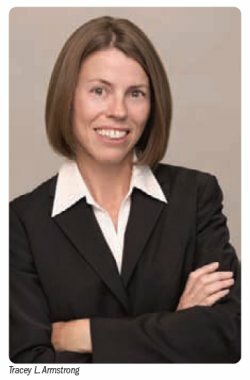 Tracey L. Armstrong joined Copyright Clearance Center (CCC) in 1989, the same year that Apple Computer, Inc. released its Macintosh Portable for $6,500 and Tim Berners-Lee was busy laying the groundwork for the World Wide Web. Flash-forward 20 years, and Armstrong is at the helm of CCC as president and CEO, a position she has held since 2007 after rising through the ranks from vice president of transactional services to executive vice president/COO. Armstrong, who received an M.B.A. from Northeastern University, has seen CCC grow from 40 employees and $10 million in annual revenue to 200-plus employees and $239 million in revenue. And in those 2 decades, the digital world has grown and evolved at record speed. “I think we’ve seen steady growth, and it’s a credit to the CCC team and to the stakeholders involved,” says Armstrong. In addition to a growing number of new staffers, CCC has been modifying the composition of its board of directors with several newcomers, including Marybeth Peters, the former U.S. Register of Copyrights, and professional authors Megan Marshall and Edward Tenner. Responding to the changing needs of today’s digital world demands CCC’s full attention. “Licensing is evolving,” says Armstrong. “It’s evolving because of the way that the users are interfacing with content.” Integrating rights into that technology is key. “The best technology is transparent. And the best licensing solutions for our users are transparent.” She cites the Apple iTunes App Store as a prime example. With iTunes, users aren’t aware that they’re actually licensing music; they’re just getting what they need, and then they’re gone. “And that’s what we want to do with our licensing solutions,” she says: make them easy to use and transparent. “Keeping up with the demands of the market is critical because you have to keep in touch with user behavior,” she says. CCC keeps the communication channels open in order to listen to users via advisory groups, international user groups, conferences, its biennial OnCopyright symposium (March 2012), and the ongoing CCC-sponsored Publishers Launch Conferences, led by Mike Shatzkin (industry consultant) and Michael Cader (founder of Publishers Lunch and PublishersMarketplace.com). Each of the venues offers insights into user needs and behavior and helps keep the ongoing dialogue fresh. Today’s digital world is just that: It’s now a global playground for content providers and publishers. As a result, CCC continues to expand its presence and breadth of coverage. This year, CCC is working with the German-based MVB, a business subsidiary of The Association of the German Book Trade, which represents 20,000 German book publishers. Armstrong explains that the MVB wanted to get a tool at the point of content for its readers and clients, and CCC is developing a German-language deployment of RightsLink. To date, CCC is licensing corporate employees in 180 countries worldwide. One of CCC’s other tenets is education, pure and simple. Armstrong is reaching the marketplace through different avenues, including social media, and providing information about the ins and outs of copyright and permissions. “It is working,” she says. “The reason I can tell you it is working is because the number of constituents in our educational program has grown exponentially.” CCC not only has a department devoted to custom programming in the U.S. and globally, but it has also partnered with other organizations in bringing CCC’s educational message to YouTube, webinars, podcasts (Beyond the Book), and video (www.copyright.com/content/cc3/en/toolbar/education/resources/copyright_basicsthemovie.html). “One of our videos was chosen by Google and put into its copyright page,” says Armstrong, adding that the in-demand videos are high-quality. “And we do make them accessible to anybody,” she says. “Our No. 1 strategy is helping the customer,” says Armstrong. “We’ve been working with certain clients for decades. And their challenges are evolving, and our solutions are evolving to meet them.” In the long run, quality definitely trumps speed, and CCC’s solutions have to work well. And that can take time. After all, “It’s a marathon, not a sprint,” she says. Armstrong is quick to point out the list of CCC products that have been developed to bring ease and continuity to the permissions process: RightSphere, RightsLink, ReadyImages, RightsDirect (a European subsidiary), RightsCentral for rightsholders, as well as licenses for academic and business. “What I really am proud of is how CCC is so solution-oriented,” says Armstrong. “We do listen to the market, and we do respond.” She credits one of CCC’s latest tools called Get It Now as an example of helping the library market. A representative from the California State University (CSU) library system approached CCC staff at a trade show and asked for help with the library’s interlibrary loan ( ILL) process. Budget constraints and the fact that the libraries aren’t open 24/7 were causing increasing problems. CSU library wanted to find a way to make the process easier for its patrons. Armstrong says Get It Now, which was released at the ACRL conference in April 2011, makes ILL more efficient by using the same workflow that library patrons use every day to access content and get the research they need. Get It Now also integrates the licensing into the process. “Now, within minutes instead of days or weeks, library patrons at Cal State can access the full-text articles they need to get their research done 24 hours a day, 7 days a week,” she says. Armstrong credits her “fabulous team of committed professionals who want to get the job done for our customers” with keeping their collective eye on the horizon. She also points to the delicate balance at play between staff and clients. “I think to be in sync as CEO, you have to be in the market, you need to be present, you need to be listening, and you need to be part of the conversation,” she says. “It’s been very important to me to make CCC more porous, more open, more present.” And while she’s the first to acknowledge the team’s accomplishments, she still sees plenty of work ahead. Part of what drives Armstrong is her obvious passion for the work; the other is the intellectual challenge she encounters every day. When she’s not on the road, Armstrong logs on to her computer at 5 a.m. to answer international emails and turns off her desk lamp at 9:30 p.m., after reading the necessary reports for the next day. Setting a high-level strategy is critical, but making sure that strategy is a collaborative effort for the entire team is just as critical. “It’s important to keep the strategy transparent for every single member of the CCC team, from the mailroom to the CEO, because every one of us is contributing to the success of our clients,” she says.